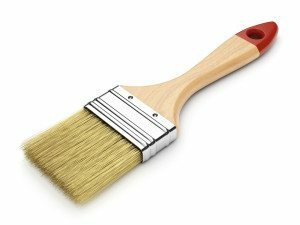 First of all, gather the necessary materials: painter’s tape, surface cleaner, tack cloths, tools to remove the hardware, putty or filler, putty knife, fine or medium sandpaper, primer, paint, rollers and brushes, and drop cloths. Next, you’re going to take everything out of your cabinets and cover your counters and floor with drop cloths, masking the areas where the walls and cabinets meet. Then carefully remove the cabinet doors and drawers, labelling if necessary. The next step is the most crucial: clean the cabinets with soapy, surface cleaner water, taking extra care to remove all of the grime and grease. Then fill and sand any nicks or scratches. Once the fill is hardened, sand down any bumps or nicks on all surfaces. After that, wipe everything down with tack cloth to get off all the dust and dirt. Priming is the next step. Spraying will give your cabinets the best finish but a dense foam roller works nicely too. Use long strokes so they aren’t so visible when done. Let the primer dry, then for a final coat, use latex, it’s easy to use and dries quickly. Apply at least two coats with ample drying time in between. When you are finished and satisfied, reattach the cabinets and drawers and install your new hardware. Voila, your kitchen now has a fresh new look. For more details see “The Paint Corner” in the February/March 2015 Gateway News or contact Brian Garleb at 618-972-9516 or bgarleb@gatewayfs.com . Superior building performance includes superior paint. Our customers depend on us to provide quality buildings, so along with our partner Walters Buildings, we work to ensure we are also providing the highest quality of steel color paint. This article, part of our “Building You the Best” series, takes a closer look at paint choices and how we ensure your building has received top-notch quality attention time after time. Also, our paint choices include 14 vibrant colors and bare Galvalume®, in addition to wide variety of complimentary trim. Whether your needs are agricultural, commercial or suburban, you can count on FS Construction services to deliver a structure that will be visually appealing, within budget, and built with the highest quality engineering specifications. 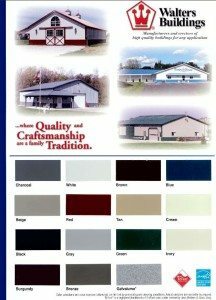 Including high quality paint choices for your high quality steel building. Give us a call at 866-551-3454 and let our specialists help design a structure to meet your needs. And stay tuned for more blog posts on buildings in our “Building You the Best” series. For 80 years now, past and present members of the Future Farmers of America (FFA) come together during FFA Week to celebrate their organization’s traditions and contributions. Today, although the letters “FFA” stand for Future Farmers of America, the FFA welcomes all students interested in pursuing careers in engineering, chemistry, business, biology, medicine and more, in addition to agriculture. In 1947 the FFA Board of Directors designated the first National FFA Week and set the annual dates to encompass George Washington’s birthday, in honor of his contributions as an agriculturalist and farmer. This year, more than half a million FFA members will participate in National FFA Week activities nationwide, February 21-28. More than 29,000 Illinois high school students will be joining in activities during FFA Week, including several local FFA chapters. These activities include not only entertainment for its members, but also learning opportunities, fundraisers, and community awareness events. The primary goal of the FFA is to make each of its members a better individual, providing them opportunities for success in leadership, personal growth and career success. Let’s hope that, for at least then next 80 years, this national celebration tradition continues. For more information, go to www.ffa.org .